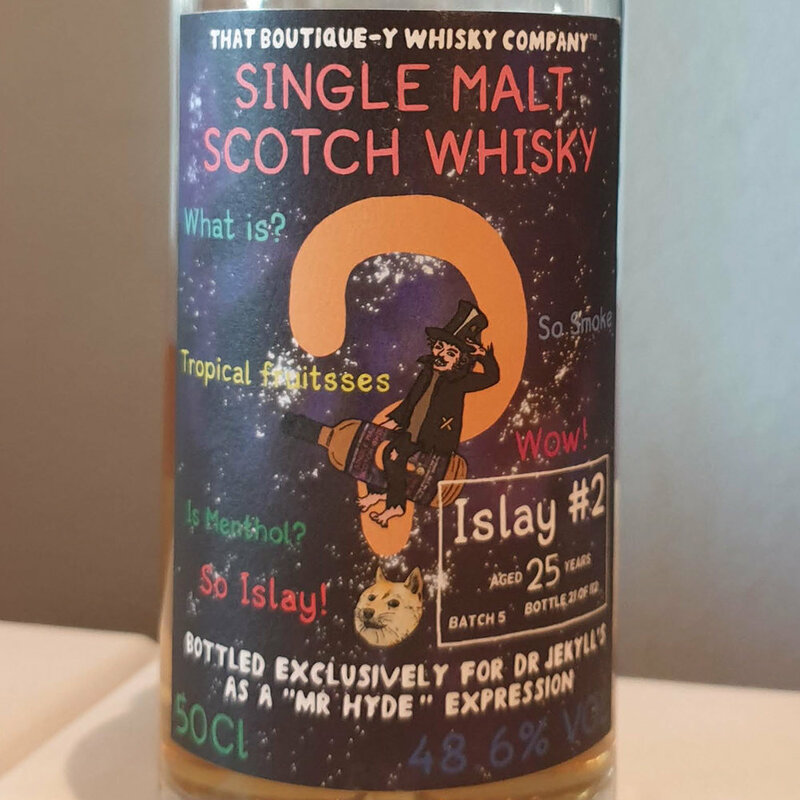 This is a release bottled exclusively for the brilliant whisky bar Dr Jekyll's in Oslo, Norway. It is bottled by independent bottler That Boutique-y Whisky Company. Very little is known about Islay #2 25 YO, other than that this is batch number 5 from undisclosed Islay distillery #2 released by TBWC. The total outturn for this batch was 112 bottles (50 cl), so we can safely say this is from one single barrel. It is probably a partial barrel at that. So which distillery is this from? Well, with older whiskies it often gets hard to tell as the distillery character will become more are more masked by the influence of the cask. This makes it harder, of course, but I’ll have a go. It is too old for Kilchoman. I do not find any floral notes here, so I’ll chance it and say it cannot be a Bowmore. As far as I recall there were no peat experiments at Bunnahabhain around 1993 (there were around 1990/91 and 1997 though). So that leaves Ardbeg, Bruichladdich, Caol Ila, Lagavulin and Laphroaig. I do not think this is a Bruichladdich, as I find no similarities with their style at all here (note that since they re-opened Bruichladdich use mainland peat - not Islay peat, but back around 1993 I assume they used Islay peat). I’ve hardly ever seen independent bottlings of Lagavulin, so again I’ll go on a limb here and say it is probably not a Lagavulin. Which leaves Ardbeg, Caol Ila and Laphroaig. My money is on one of the last two. Let me know what you think! You can buy the Islay #2 25 YO in Norway at NOK 2240 (10815802). Nose: Oh, this is an old and distinguished peaty Islay whisky, that's for sure. Drift wood bonfire in the distance. Notes of iodine, sea breeze, and old bandages. It comes across as mild and delicate at first, but after a few minutes it wakes up and appears a lot more vibrant and fresh. Even the peatiness picks up, with an added spicy note now. Taste: Full body and a rich, creamy mouthfeel. Surprisingly peaty on the palate, wood smoke, barbecue, and soot. Youthful but well matured at the same time. Fiery peppers and chilis, with toasted oak. Briny in character. Finish: Long finish. Perfectly balanced peat and sweetness, with intertwining notes of oaky spiciness. Warm and comforting. Chocolate mousse and cold espresso with a sprinkling of ashes.